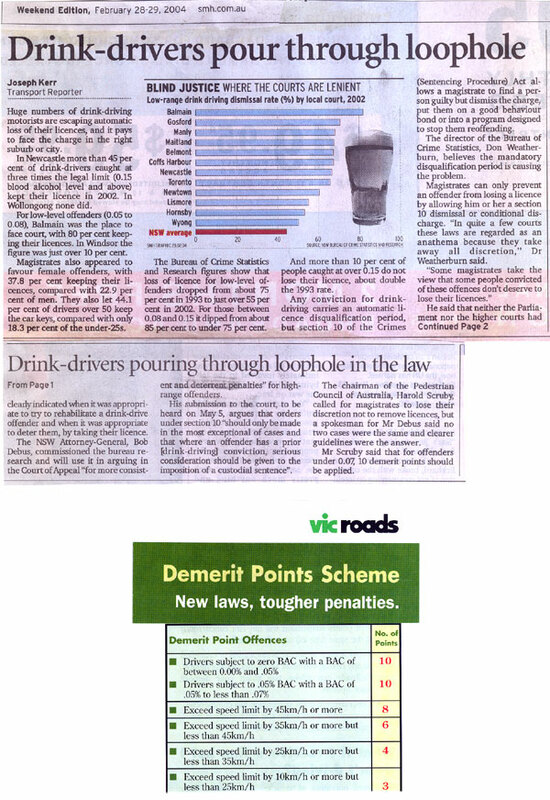 In yesterday’s SMH it was revealed that in the some areas of NSW, up to 80% of motorists convicted of drink-driving are not losing their licences and that in Newcastle more than 45% of motorists convicted of high-range BACs kept their licences in 2002. The Chairman of the PCA, Mr Harold Scruby has again called on Roads Minister Carl Scully to immediately follow the Victorian example and remove magistrates’ discretion for convictions over 0.07 requiring automatic loss of licence for the statutory period and also apply automatic 10 Demerit Points for all drink-drive convictions under 0.07. Mr Scruby said: “This is a scandal. Every year the drink-drive statistics worsen and the government does nothing, while the NSW Road Toll is out of control and up to 40% of the deaths on our roads are due to alcohol. We are pleading with the NSW Government to immediately amend the law so that magistrates lose their discretion to allow motorists convicted of drink-driving offences to keep their licences. This is not about sentencing guidelines, it’s about saving lives. It’s about fairness, equity and consistency and getting the message across, loud and clear, that if you drink and drive, you will lose your licence. And if you continue, you will go to jail. “The use of Section 10 of the Crimes Act, which allows magistrates to find a person guilty of criminal offences such as drink-driving, but dismiss the charge and not record the conviction is an utter farce. Many motorists get off many times under Section 10 and there is no limit as to how many dismissals or strict guidelines as to when the Section 10 should be applied. And how must the NSW Police feel, after all their hard and dangerous work, to see these criminals thrashed with a feather? “Even more farcical is that once received, a convicted drink-driver is not even required to state that he or she has been convicted of drink-driving (including high-range) when completing a motor-vehicle insurance policy. Yet these people are from the very group that is far more likely to have a future crash. So why aren’t the insurance companies (motor-vehicle and CTP) screaming out to have this ludicrous system and legislation overturned? Mr Scruby added. “In a recent case reported in the Daily Telegraph (30/12/03), a 32 year-old man was banned from driving until 2049, because he had a ‘shocking’ driving record including 57 high-range drink-drive convictions. What sort of system allows this to happen? Why is the system all about letting drink-drivers off and why do magistrates only jail drink-drivers when they kill or seriously maim, instead of jailing them before they kill and keeping them in jail until they prove they are no longer a threat to society?” Our policy is clear and simple: ‘three drink-drive convictions within 10 years, banned from driving for life. Drive again, automatic jail, no right of appeal.’ A licence is a privilege, not a right. “In NSW drink-driving’s OK and speeding is not. In NSW, drivers booked at 30 kmh over the speed limit, automatically lose their licences for 3 months and for over 45 kmh, it’s six months. The same applies if a driver reaches 12 demerit points in 3 years. There’s no appeal, no Section 10, no pleading that the perpetrator wasn’t breast-fed, or someone took their toys away or someone shouted at them before they were seven. It’s off the road for the statutory period. “In the UK, it’s now a mandatory, minimum 12 months disqualification for all drink-drive convictions and they have one of the lowest Road Tolls in the world. In NSW, it’s drink-drive, get-off. And the increasing NSW Road Toll is a perfect reflection of a system which is out of control.” Mr Scruby said. The Chairman of the PCA, Mr Harold Scruby, has written Roads Minister Scully, asking him to immediately amend the law so that Magistrates lose their discretion to allow motorists convicted of drink-driving offences to keep their licences. “This just goes to prove that Magistrates cannot be trusted to enforce the law when it comes to drink-driving offences. They do not see drink-driving as a crime, they see it as some sort of social misdemeanour and rarely if ever jail even the worst recidivist drink-drivers, until they kill or seriously injure some innocent victim. Yet alcohol is responsible for up to 40% of the deaths and injuries on our roads. Mr Scruby said. “In Victoria, Magistrates have no discretion if a driver is convicted at .07% BAC or over. They must impose the statutory penalties including loss of licence for the required time. 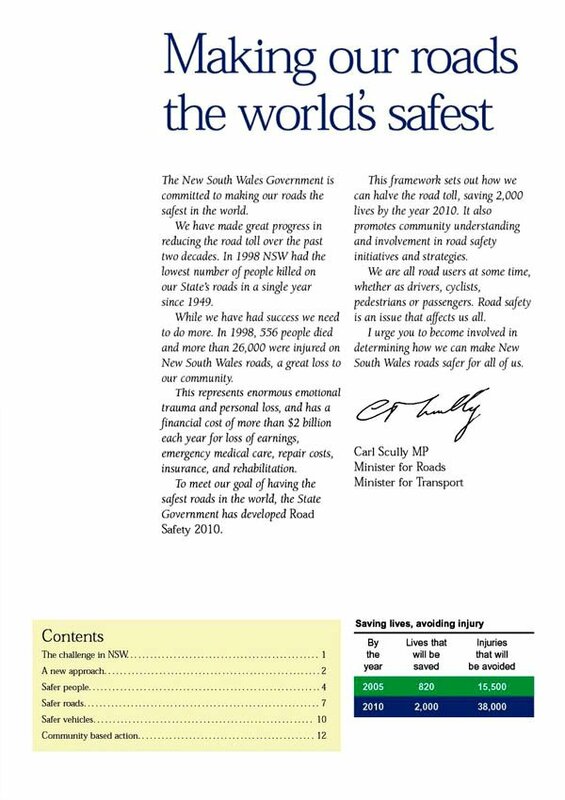 “Mr Scully has committed his government to achieving the safest roads in the world by 2010 (see attached). This includes saving 2,000 lives by 2010 and 820 lives by 2005 (just over 16 months away). 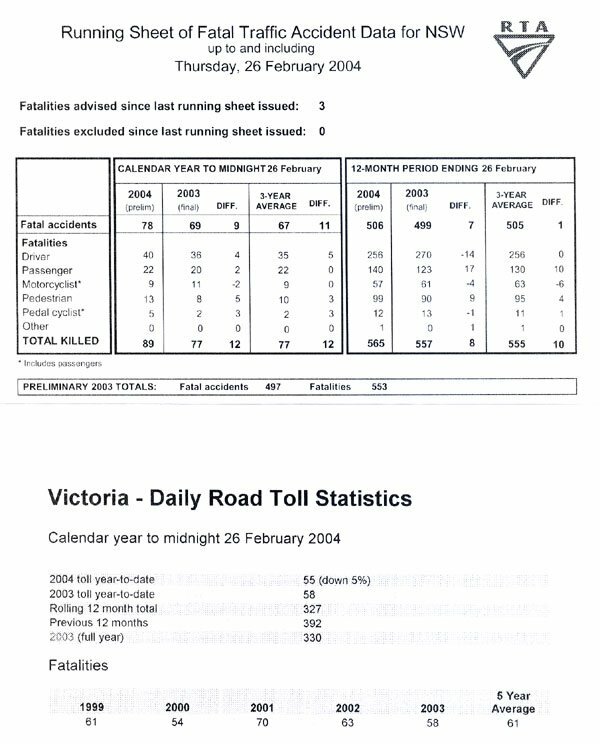 Yet since late 1999, when this bold initiative was announced, fewer than 30 lives have been saved (see latest fatalities data attached) and we are again likely to exceed 500 deaths on NSW roads in 2003. How can he possibly expect to achive these targets when motorisits convicted of drink-driving do not lose their licences? And the simple message to the community is – DRINK-DRIVE – GET-OFF. “Drink-driving in NSW is a farce and has been a farce for years; a game of pass-the-parcel between the government and the courts. Sentencing guidelines are a joke. And meanwhile, hundreds of innocent people are dying every year on our roads. “Please Mr Scully, we beg you, bring some justice and equity back into our courts and immediately remove Magistrates’ discretion for all drink-drive convictions.” Mr Scruby said.